From the hamper, to the washer, to the sock drawer, there are several places that socks can lose their match. 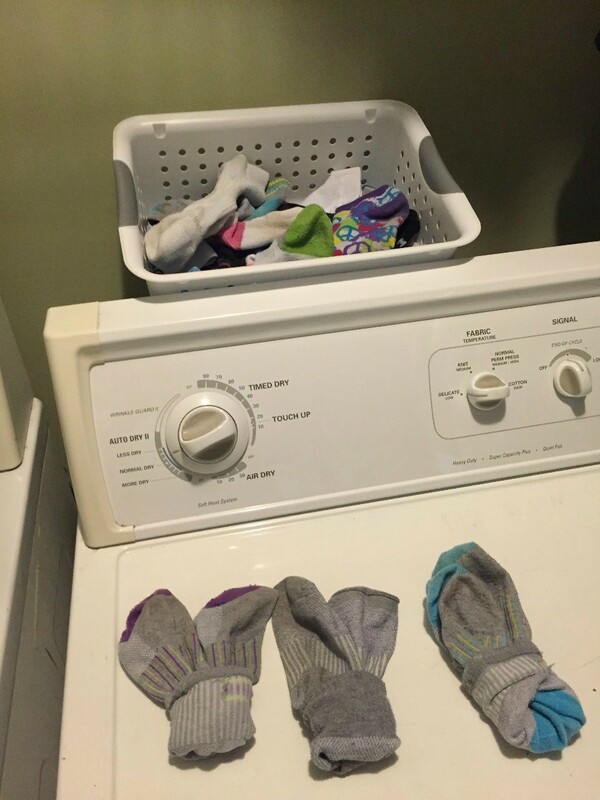 The mystery of missing socks will likely never be solved, but there are ways to increase the probability of being able to find two socks that go together, even in a large household. This is a guide about organizing socks. We're constantly losing one sock in a pair. I started keeping unmatched socks in a bag as I put laundry away. Every time I'm putting a load of laundry away, I check the unmatched sock bag in case I can find a sock to match the "new" unmatched socks. Sure enough, I'll be able to match up one or two pairs while two or three pairs of unmatched socks go into the bag. Don't ask me why the bag is growing but at least I'm matching some socks instead of throwing them out before I find their partner. Buy socks that are all alike. I store them without folding them into each other also. They stretch out faster if you fold them into a ball. The advantages to this practice: no matching-up socks and when one wears out, gets a hole or gets lost you have automatic replacements. You can still buy socks of different kinds. I have white socks for tennis shoes and dress socks, but the whites are all alike and the dress socks are all black and alike. I think this saves money in the long run. I bought the net type washing bags for lingerie and delicate things. Each person in the family has a sock bag. The dirty socks are put in each person's bag, then I wash them and dry them in the bag. Then the bags are given to each person, so they can put up their socks. If a sock is missing, then you know the person it belongs to needs to look under the bed, etc., until they find the sock. It has kept most all those wild socks corralled, and we don't have as many strange pairs as we used to have! 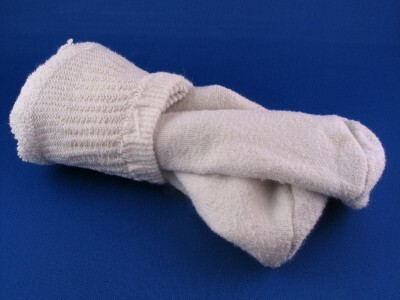 The one item I never put into a dryer is socks, because they always seem to shrink in there. So instead they get hung on the washing line on good days, or indoors on a foldaway airer on rainy days. Either way, this makes for a good opportunity to sort socks into pairs at an optimum time. It's a job I am sure that most of us hate, but if you do it as you hang them up it is an absolute breeze to sort out which matches what. Then very simply bunch the pairs together as you take them down once they are dry. Have a shoe box or something similar for odd socks and keep them in there for a few weeks in case their partners turn up on a subsequent washday. 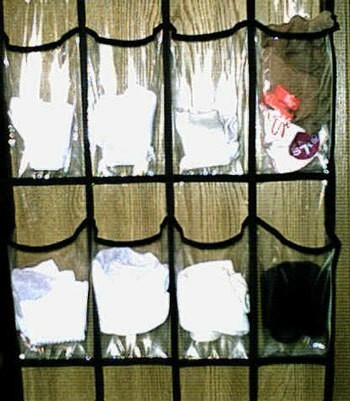 Instead of using those plastic over-the-door shoe organizers for shoes, I use mine to organize our socks! After taking the socks out of the dryer, I just roll them up and place a pair in each pocket of the shoe organizer (I do this with pantyhose and knee-highs too). When doing laundry I always have socks that don't come out with their match partner! Instead of just throwing the single sock into the sock drawer I propped a plastic utility basket up between the top part of the dryer and the wall. This is where I put all the single mismatched socks I find while doing laundry. 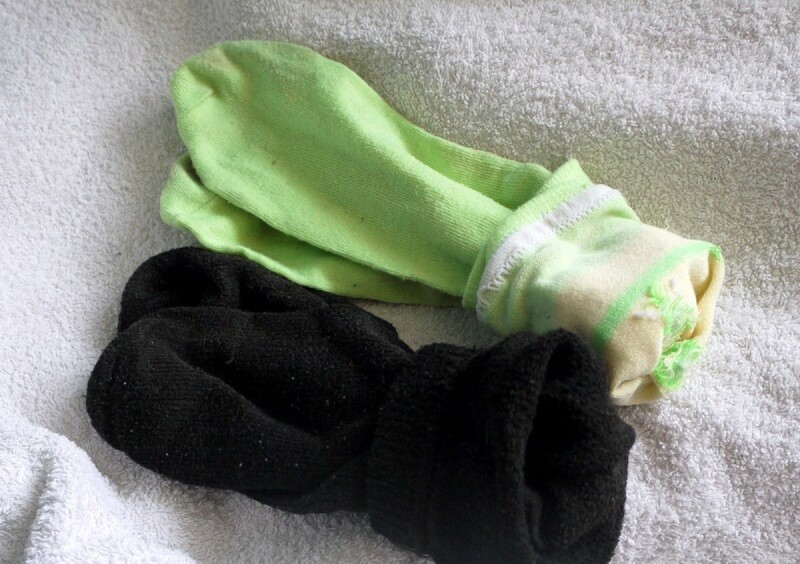 To prevent losing socks in washer and dryer, pin the pair together with safety pins. My three year old loves to play matching games. So when I am sorting and folding the laundry, I plop a large pile of socks in front of her to match up. She thinks it is a game and I get my laundry chore done faster! With three kids in elementary school at the same time, keeping up with socks was not working, I got three packs (6 pair each) of white socks on sale that fit everyone. I bought one of those mini square plastic baskets that look like a small laundry basket and placed it on the closet shelves above our hanging clothes. I use it for socks instead of a drawer, it frees up drawer space. I keep a cork board hung up in the laundry room. Each time I fold socks I take the strays and pin them up to the board. Next time I have strays, I check the board which usually has the match. I keep sock pairs matched so they are worn the same number of times, by numbering them when I take them out of a package. Starting with #1 on a pair, after washing simply match up the numbers. One of the best ways I've found to organize my socks is using these sock drawer organizer boxes from HomePro Goods. You can use them in several ways depending on the thickness of your socks and season. I use the dividers in glass bottle beer cases as sock dividers in my drawers. These dividers work just as well as the commercially sold ones in the organizational stores, but they are free. Organizer for Kids Socks. I have recently discovered that there actually is a solution for mismatched baby and kid socks! No more lonely socks hanging out at the back of enormous dresser drawers. When my children were home we could never match socks for each person. So I decided for my husband and son that one person got the solid white crews/tube sock and the other person got socks with stripes. When doing laundry, often we get socks that have gone bad and need to be tossed. Yet, it seems like they always wind up back in laundry. 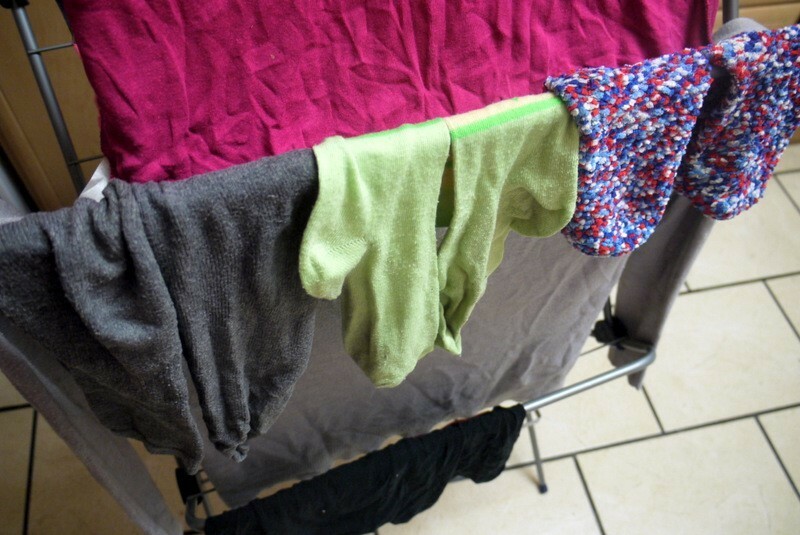 If you place the socks at the bottom of the wash load, they are less likely to be thrown over the top of the washer and pumped out with the water. I read this tip somewhere years ago, and I have raised three kids and a husband using it with very few lost socks! This is a great tip that I have found works very well. Place a small basket on the top of the dryer, one for each family member. When the clothes are dry, you can throw each member's socks in the basket. I was tired of losing socks in the wash so I came up with an easy idea to keep them together. I safety pin together my sock pairs! Most households have safety pins lying around, so put them to good use! In 44 years of being a wife and mother I can honestly say I have never lost socks in the wash. I taught husband and kids to fold socks together when they took them off. I only put pairs in the machine and always at the bottom of the machine. Each family member has a different color sock; 4 boys, my husband, and myself. Makes it easy to sort. Black, gray, white, gray with a stripe, and gray with a colored heel. Socks! The washing machine must eat them. Buy several pair of the same make, model, and color and not only do you save time sorting laundry, but if one goes bad or missing, you still have back-ups and an extra. When they get a hole, cut off the top part and sew on as knitted cuffs on long-sleeve shirts or sweats when the sleeves are too short. I often buy several pairs of the same color of socks so that if one sock of the pair wears out, there will still be several mates. I have two small boys and while sorting socks, I find that although they wear different sizes when rolled they all look like the same size. I roll one boy's toes tucked in and my other boy's socks toes out of the "ball". I can put them in the correct drawer without much thought and each knows at a glance if they have the right socks. Always buy mens and boys' socks in quantities of a dozen or more of matching pairs. This reduces the need to pair-up the socks before washing and greatly reduces the length of time playing the sock matching game. Great tip! As an old bachelor I learned years ago to buy a dozen or two each white cotton tube socks and black cotton socks. You don't have to match them up and you won't ruin the elastic by rolling them in pairs.